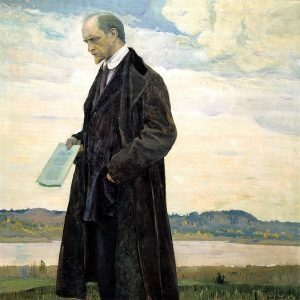 Ivan Ilyin (1883, Moscow – 1953, Zollikon, Switzerland) was an outstanding Russian political and religious philosopher, publicist, and supporter of the White Movement and monarchy in Russian. He received a degree in jurisprudence in 1906 and began work as a scholar at the University of Moscow in 1909, where he read courses on philosophy and law. Although initially enthusiastic of the revolutions sweeping Russia, his opinion changed after witnessing the brutalities of the October Revolution, and in 1922 he was forced to emigrate on a Philosophers’ ship. He edited the journal Русский колокол (Russian Bell) and became one of the founders of Russian philosophy in exile. After a four-year persecution by the Nazi government, he was able to travel to Switzerland in 1938, where he would spend the rest of his life working for the Russian cause. In 2009, his body was repatriated and reinterred at the Donskoy Monastery, where Ilyin had wished to be buried. The text below is a chapter from Ilyin’s most personal and spiritual work, The Singing Heart (Поющее сердце), which was first published in 1958 by Ilyin’s widow in München. It is a spiritual, theological, in some cases political, and biographical work which is deeply influenced by the Orthodox and Russian spirits, and in a certain sense, can be considered one of the hidden masterpieces of Russian spiritual prose. The chapter is a response to a letter from Ilyin’s son on questions as diverse as love, creativity, and a solution to the spiritual crisis of the Western world, no mean feat for such a short text and speaks of the author’s skill and mastery of his craft. Man cannot live without love, because love itself wakes up within him and rules him. And this has been given to us by God and nature. We are not supposed to arbitrarily control our inner world, remove some sincere feelings, replace them with others and implant new ones that aren’t our own. We can raise ourselves, but we cannot break ourselves down and build something new according to our own design. Look how the life of man flows by. A child turns to its mother with demands, expectation, hope, pleasure, comfort, mollification, and gratefulness. And once all this crystallises in primal and most tender love, then its personal fate is sealed. The child looks for its father, expects a greeting from him, expects help, defence, and leadership, relishes his love and loves him back in turn. It is proud of him, imitates him, and feels its father’s blood within itself. This voice of the blood speaks within it for its whole life, links it to its brothers, sisters, and its entire line. And when it later flares up with mature love for ‘her’ (or, correspondingly, for ‘him’), the task is to turn this ‘awakening of nature’ into a long ‘visit of God’ and accept it as one accepts one’s fate. And is it not natural for him to love his children with the same love that he waited for from his parents in his young dreams? How can one do without love? What can it be replaced with? What can fill the terrifying void that forms when it is absent? Man cannot live without love, and this is why it is the main selective force in life. Life resembles an enormous stream that is boundless on all sides, which crashes down onto us and carries us with it. Not everything that it carries may live; one should not surrender oneself to that whirling chaos of substance. The man who tries to do that will lose and ruin himself: he will not escape, because he will die in the mixing of all. One must choose: refuse a great many things for relatively little, and this little must be attracted, safeguarded, valued, collected, grown, and be perfected. This is what personality must be built with. The selective force is love: it ‘favours’, ‘accepts’, values, safeguards, keeps, covets, and is loyal. Will is but the tool of love in this making of life. Will without love is empty, harsh, hard, violent, and, what is most important, blind to good and evil. It will quickly transform life into penal discipline under the command of vicious men. The world already has a whole series of organisations built on such principles. May the Lord guard us from them and their influence… No, we cannot do without love: it is a great gift to see the better, choose it, and live by it. It is the necessary and valuable ability to say ‘yes’, to accept and begin selfless service. How horrible is the life of a man who has been separated from this gift! What a void, what depravity his life turns into! For human creativity does not appear out of nothingness and does not flow in a random combination of elements, as many haughty men now think. No, one can only create by accepting the God-given world, by entering into it, by growing in its wondrous order, and merging with its mysterious paths and laws. And this requires the entire force of love, the entire gift of artistic transformation that is released to man. Man does not create out of nothing: he creates out of what has already been created, out of that which exists, creating the new in the bounds of the reality that has been given to him out of the external-material and the internal-spiritual. The creating man must internalise the depth of the world and sing from it by himself. He must learn to contemplate with his heart, see with love, leave his small personal shell for the bright reaches of the divine, find his Great (affined) co-possession in them, feel it and create the new from the old and the unseen from the eternal. This is how things are in all main areas of human creativity: in all arts and in science, in prayer and the just life, in the interaction between people and in all of culture. Culture without love is a dead, doomed, and hopeless affair. All the great and genius creations of man were created out of the contemplative and singing heart. Man cannot live without love, because the most important and valuable things in his life reveal themselves to the heart. Only contemplative love reveals someone else’s soul to us for loyal, heartfelt communion, to mutual understanding, to friendship, to marriage, to childrearing. All this is inaccessible to heartless men. Only contemplative love reveals a man’s homeland to him, i.e. his spiritual link to his native people, his national loyalty, his spiritual and inner womb . To have a homeland is a happiness, and one can have it only through love. It is not for nothing that the men of hate, the modern revolutionaries, are internationalists: by being dead to love, they are separated from their homeland. Only contemplative love opens the way to religiousness and God to man. Do not be surprised, my dear, by the unbelief and faithlessness of the Western peoples: they took an incorrect act of faith from the Roman Church which begins from the will and ends with rational thought and, having taken it, disdained their hearts and lost the art of contemplation. This is what predetermined the religious crisis that they are suffering through today. You dream of a strong will. This is good and necessary. But the will is terrifying and destructive if it does not grow from a contemplative heart. You want to serve a just cause. This is right and excellent. But how will you see your goal if not by contemplation of the heart? How will you recognise it if not by the conscience of your heart? How will you see its rightness if not through love? You want justice, and we should all look for it. But it demands artificial individualisation in our perception of people from us, and only love is capable of truly perceiving people. Furious battle against wrongdoers is necessary and a lack of aptitude for it can make a man into a sentimental traitor. But this anger should be born from love, it should be its embodiment, in order to find justification and boundaries for it… This is why I said that you are “right and wrong”. And there is something else: I understand your sentence about “better not to speak of love”. This is true: love must be lived, and not be spoken of. But look here: open and insane propaganda of hatred has been spread through the world; a persistent and ruthless hunt for love has begun in the world: a crusade against the family, a denial of the homeland, the suppression of faith and religion. The practical heartlessness of some has grown into a pure sermon of hatred of others. Crudeness has found its apologists. Rage has become a doctrine. And this means that the time to speak of love and rise up in its defence has come.